This was the way of life for many all over the world, including on this small island in the Philippines, which was founded by Mario’s great grandfather and two uncles. They had named this island ‘Apo’, which means grandchildren, and surely there were grandchildren a plenty. Mario himself was a child of Apo. The main village of Apo was nestled in the centre of the island beneath two mountains, offering the people some protection from the wild storms of Typhoon season. When Mario was young he was able to count only nine houses, but as the village grew over the years, so did the number of fishermen. The more underwater explosions could be heard. The more corals turned to rubble, and slowly the sharks and sea turtles began to disappear. Mario was already a seasoned fisherman, who had himself hunted turtles for soup and sharks for their fins. He had learned how to do this from his elders. He would fish under the stars by night and under the tropical sun by day, and travel from island to island to sell and buy fish with his mother. Mario, however, was different from other young boys his age, whose minds would develop to revolve around the cycle of catch and eat. He would grow up to be an astute pupil of the world. Despite his young age, he had already observed that the world was changing a lot in his lifetime for the worse. He saw that as the seafarers kept fishing, so did the numbers of fish become less and less. Trails of broken corals marked the underwater world. It was the story of not just Apo, but of other nearby islands like Cebu and Sumilon. The future of Mario and his people was becoming less certain by the day. Until one day it was as if the heavens of the universe sent Mario a ‘grand-fatherly’ angel to give him the gift of wisdom in order to help save his people. He came on a boat. He was a marine scientist named Dr. Angel Alcala. The scientist approached Mario’s mother, who was the island chief at the time, and asked her whether she might trust his judgement and try something new in order to save the island from losing its underwater bounty any further. 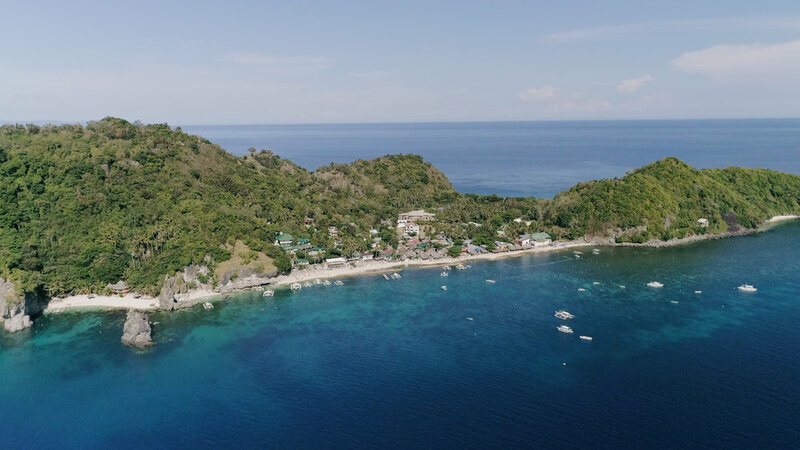 The scientist said that the village must block off a section of reef from fishing in order to give nature a chance to grow back and to recover. Mario’s mother was an intelligent woman, who could see the virtue of wisdom that this scientist had to offer, and so accepted this gift of knowledge. She sent her son to guard this new marine sanctuary. So, every night, under the stars, Mario would walk to the sanctuary. At the same time other town mothers were sending their kids for bed under the light of kerosene lamps, Mario would roll out his palm-woven mat, and would watch the darkness of the sea. Sometimes, he slept on the beach on his own and, on other nights, he gathered other boys of the village to join him. While he was sleeping, perhaps the infectious glow of stars, which leads people to their very dreams, grew fond of this boy. Their celestial light blessed him every night. Mario was sleeping with the cycle of the moon. He was sleeping as nature intended him to sleep – under the roof of the heavenly universe. He would often pray to the moon and the stars to shine brighter so that they could light up the sea, so he could see when illegal fishermen crept into his marine sanctuary. So, wrapped in the night blanket of Mother Nature, this young boy grew. He grew tall and confident. He grew to become the head of the sea wardens. Then, once his mother passed away, his father became chief and he too shared Mario’s affection for the marine sanctuary. Mario would grow stronger into a man like his father, but not just any man – an island chief with a dream so big that it was difficult for even some of his family to understand. He would stare at the stars, dreaming of a healthy blue vibrant marine sanctuary that would one day flourish again, full of fish. He would grow to be a fair but firm chief, who would take protecting the land and sea so seriously that he would one day jail his very own aunty for chopping down a native tree. In Mario’s eyes, even family was not exempt from the rule of law and respecting mother nature. So, with a heavy but honest fist, he would protect the sharks, the turtles, the trees, the birds, the bats, the mangroves, so many more things, including the monitor lizard, until Mario’s dream eventually became true. Decades later, the jacks and giant trevally school in and out of the marine sanctuary, corals blossom around the island in colours of pinks, greens, yellows and orange-browns, and even the sea turtles returned. The sharks and manta rays may be gone, but the heroic courage of this young boy who slept under the stars had turned Apo, the island of grandchildren, into a legend in Filipino history. This young Mario helped to inspire the birth of the nation’s marine protected area movement. Hundreds of island villages heard about the magic of marine sanctuaries and moved to create their very own laws to facilitate a renaissance of the sea. And, although the chiefs, who created these new laws, may not have known where the culture of this movement truly began, Mario’s story will remain a legend on Apo for generations and generations to come. However, his story does not end here. Once Mario retired as the island chief of Apo, he realised that he had a problem: his dream to protect his island forever was in danger of dying with him. The population of his island had exploded to about a thousand people, and many people, especially people with power, simply were not interested in caring for nature. Maybe it is because they had not slept under the moon and stars protecting a marine sanctuary like him? So, for Mario, now in his middle age, there was a new challenge he had to face. If his dream was going to live on, he needed to inspire generation after generation to be like him. He began to dream of a world full of dive masters and sea rangers, just like him – the kind of people who value conservation above fishing, above mankind’s material way of living. He also knew that the young people could earn more as a dive master than gambling a game with fishing where sometimes you catch a fish, and sometimes you go without money for the day. So with the help of a foreigner, he became a dive instructor, set up his own dive shop called Mario’s Dive Home Stay, earned himself a university degree, and began putting his earnings into training his people. But he needed more help, if he was going to train the poorer daughters and sons of fisherman to secure a brighter future for Apo. He had bills to pay – like expensive dive course fees, and masks and fins for students. All expensive things out of the reach of a poor fishing village and out of his already humble pocket. It was a big dream, but not an impossible dream. Sometimes, when you dream very hard, dreams do find a way of coming true – and, so for the second time in his life, another dream of Mario’s came true. Over the years, because of Mario’s deeds, Apo had became known around the global diving community for its turtles and fish biomass, and so soon word spread that Mario needed help. Some French travellers from Plongeurs du Monde arrived at his door. They came on a mission to help him train his students from the earliest age of twelve and returned for once a year for seven years, watching these kids grow up to be just like their elder, Mario – until their mission finally ended. There were tears in their eyes when the travellers left, but there was also joy. The travellers ended their stay with a graduation and fiesta. In April 2017, the graduates gathered at the village basketball court. The local villagers came to see what was going on, and so did some important people from as far as Manila. There was a pig on a spit, a lot of cake, and a disco dance, and a techno musical introduction welcoming Mario to the stage. He spoke of his childhood journey, and then announced that he would take his students on a mission to save the ocean. ‘Who is with me?’ he cried out to his students, who were all staring up at him in awe. And, then – all the pupils raised their hands. So, upon invitation from a neighbouring island chief, Mario, once again put his hands in his pocket. He found a boat captain willing to take him and his new dive masters across the sea to Siquijor to inspire a new generation. They piled onto his small boat with an old motor and flaking paint, which stalled and started a number of times on the open sea. It was a calm day – yet, things could have gone very wrong as just the night before the rain poured down like a monsoon. By day, fortunately the heavens had cleared and the sea resembled a smooth marble tabletop, with a gently ripple carrying their frail fishing boat along. Right now, as I (the author) write this story on the 23rd April 2017, Mario’s pupils, many of whom were once fishermen or the sons and daughters of fishermen, are camping on Piliton Beach under the stars and coconut trees, ready to rise in the morning under the warm tropical sun. Mario has charged them with the mission of training the sons and daughters of Siquijor fishermen, who share the same story. However, the legend of Apo will not end on Siquijor. Mario will keep this journey going until the day he dies. He is now 52 years of age. The lines of age have settled in around his mouth where he seems to be smiling almost every second moment of the day. He believes if he stays fit and healthy, he can at least live for another 25 years - enough time to carry out his new mission. No matter how near or far, Mario will keep travelling from island to island, to country to country, until he reaches his new dream to save the world. He is not yet sure how he will do it with the few pesos in his pocket, but secretly he knows that his blind faith in the celestial stars of mother universe will somehow lead him there – and this is what makes the story of Mario so rare. He is a resilient leader full of goodwill. Often the burden of politics and fighting for change wears down the soul of a leader with such a big heart and an honest head, who gives and gives without asking for anything in return. However, every now and again a legend is born, a good person with the courage to conquer the malaise of society when we lose our way. The universe knows that Mario will overcome every quest and hurdle that is set before him, and one day, when he dies and I return to Apo and I look at the stars, I will remember Mario as one of those legends – a hero who I know will change entirely the direction of the way our human world spins. Take note of every person you meet like this, and enjoy the moment you spend with them, because you will find that you leave with a happy heart. You see, about ten years ago, we met the Father of Costa Rica’s national park system, Alvaro Ugalde, who helped to protect two thirds of his country. Less than a year ago, we met the Caribbean’s Mother of Conservation, Idelisa Bonnelly, who created the first humpback sanctuary in the world. And, today, I realise that we have met the Philippine’s Father of Marine Sanctuaries – Mario Pascobello, the protector of Apo. I believe Mario is an unsung hero, who will one day become so worthy of note that he will be remembered in the world divers hall of fame.